Mmmm...gooey melted cheese, who could ask for more? Pair it with cut up fruits, veggies, and breads, and you've got a fun and surprisingly easy meal. The base for the fondue is a combination of vegetable broth and white wine, with a little dry mustard added for some kick. The wine gives this a sweet fragrance, but a savory undertone (I used a Chardonnay). The recipe suggests Emmenthaler or Swiss: I used the cheaper of the two and went with the Swiss. I think this gave the fondue a very mild flavor, so maybe the Emmenthaler would have been better, but not for $11 a wedge. A dash of nutmeg adds a fragrance to the fondue, plus that wonderful flavor that goes so well with cream sauces. A small amount of flour is also added for thickening; unfortunately, I think this made the finished product a little gritty and not as smooth as I imagined a fondue would be. Still, the overall taste was good (I mean, you can't REALLY mess up melted cheese). 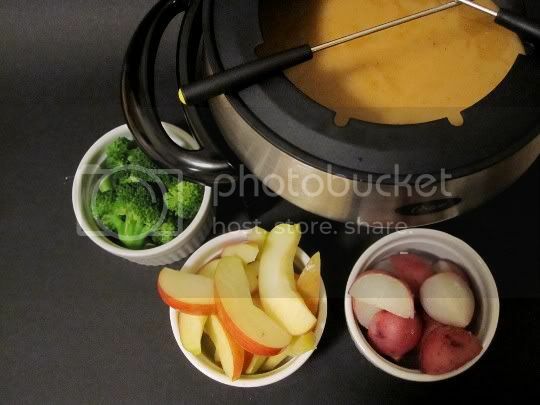 A slight skin did begin to form on the fondue, but nothing a little gentle stirring can't solve. I used steamed broccoli and baby red potatoes, sliced apples, and cubed sourdough bread for dippers: these worked well, but I think maybe some sliced veggie sausages would be a great addition too. A note about the recipe: the addition of a small amount of Kirsch (sour cherry brandy) is listed as "optional" to add to the fondue, but this stuff is hard to find. When I did find it, I certainly wasn't going to pay $35 for a bottle of something I'd probably barely use. Unfortunately, I can't say what this would have added to the fondue, since I've never tasted it...but feel free to give it a shot! Make again? Yes, but with a stronger flavored cheese...maybe the Emmenthaler, a nice Gruyere, or even a sharp Tillamook cheddar. Or you could get really crazy and try one of the stinky cheeses. Yum!